First take the shredded paneer, ajwain and salt and mix it together and make it two small balls. Now take the chapathi dough, flatten it into a small circle. Now keep the paneer ball in it and cover it just like kozhakkatai. Again spread the dough into circles. I prefer to make smaller ones. 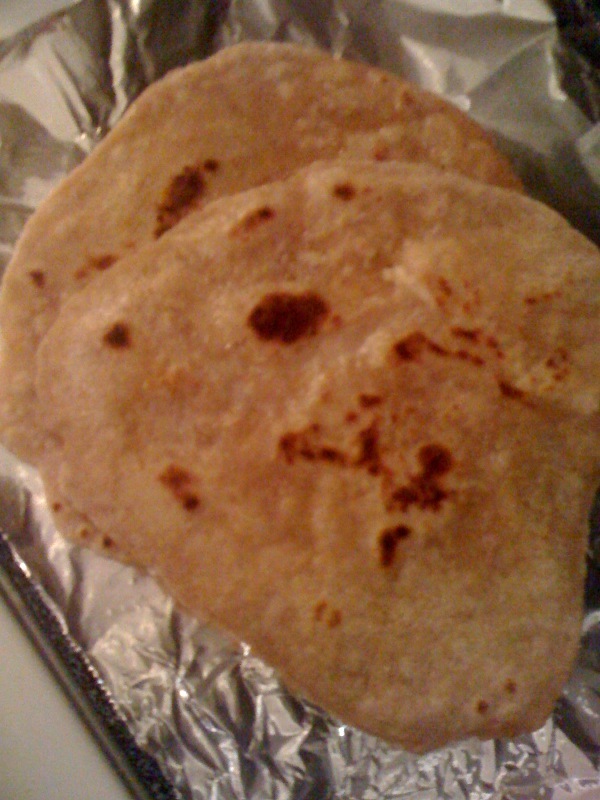 Heat a tawa and cook the parathas in medium flame. Flip it when one side is half cooked. Spread a teaspoon of ghee (optional) on top of it and enjoy it with a good bhaji. My girlie likes to have it with a dallop of butter. I got this Strawberry Muffin recipe from AllRecipes.com. 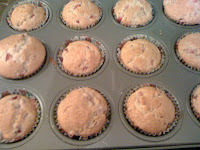 I followed the same recipe and the outcome was awesome as you can see in the picture. 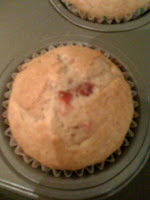 The taste was also wonderful.. I made this vendhaya kozhambu and it came out very yummy. I got the recipe from my MIL. I haven't tried this before. So thought of giving it a try. Here goes the recipe. Soak tamarind ball in water for half an hour (or Microwave it for 30 seconds). Squeeze water from it and keep it aside. In the mean time, dry roast the ingredients given for grinding and let it cool. Take a wide pan, heat the sesame oil, splutter mustard seeds, add the channa dhall, urad dhall and red chillies and let it fry till it becomes golden brown. Now add the tamarind water (approximately 1 1/2 cups), turmeric powder, required amount of salt and let it boil for 5 minutes. Add the grounded powder immedately after it starts boiling. Reduce the flame to medium and let it cook for 7 to 10 minutes. Stir it in between. Now add the jaggery and let it cook for another 5 minutes. Oil will start spreading out. Turn off the stove when you get the required consistency. Mine was little bit thick. It goes very well with rice and also as a side for curd rice. My chitti makes tomato poori. She infact advised me to make these kind of pooris for my girls. 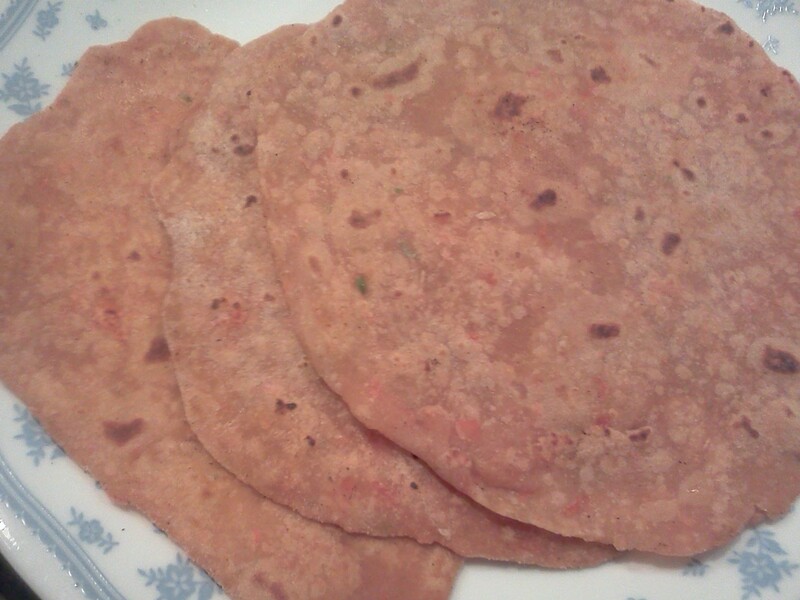 I tried this tomato Chapathi very long back and managed to find time to post this recipe. Here goes the recipe. First boil the 1/2 cup water. 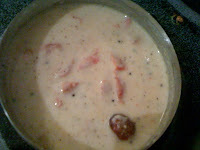 Put the two tomatoes in it and let it boil for few minutes. Let it cool and peel the skin. Now take those tomatoes, green chillies and salt and grind it into a fine paste without adding water. The paste will be watery by itself. Now take the wheat flour in a wide bowl, add the tomato paste, omam and mix everything well and knead it into a fine dough. Sprinkle water if necessary. Make lemon sized balls and spread it into 8 or 9" diameter circle. Cook it in a hot tawa. Enjoy it with a dallop of yogurt or any of your favorite side dish.